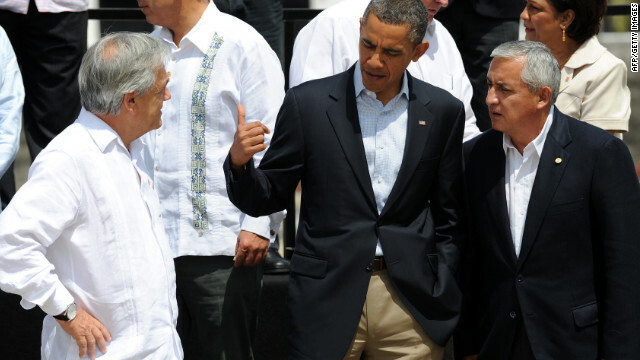 President Obama speaks with Guatemala President Otto Perez, right, and Chile President Sebastian Pinera, left, in April. Editor's note: Christopher Sabatini is the editor-in-chief of Americas Quarterly and senior director of policy at Americas Society/Council of the Americas. Ryan Berger is a policy associate at the Americas Society/Council of the Americas. The views in this article are solely those of Christopher Sabatini and Ryan Berger. Somebody forgot to tell the Washington brain trust. The Center for a New American Security, a respected national security think tank a half-mile from the White House, recently released a new series of policy recommendations for the next presidential administration. The 70-page “grand strategy” report only contained a short paragraph on Brazil and made only one passing reference to Latin America. But the need to shore up our allies and recognize legitimate threats south of the Rio Grande goes to the heart of the U.S.’ changing role in the world and its strategic interests within it. 1. Today, pursuing a global foreign policy requires regional allies. Recently, countries with emerging economies have appeared to be taking positions diametrically opposed to the U.S. when it comes to matters of global governance and human rights. Take, for example, Russia and China’s stance on Syria, rejecting calls for intervention. At a time of (perceived) declining U.S. influence, it’s important that America deepens its ties with regional allies that might have been once taken for granted. As emerging nations such as Brazil clamor for permanent seats on the U.N. Security Council and more representatives in the higher reaches of the World Bank and the International Monetary Fund, the U.S. will need to integrate them into global decision-making rather than isolate them. If not, they could be a thorn in the side of the U.S. as it tries to implement its foreign policy agenda. Worse, they could threaten to undermine efforts to defend international norms and human rights. 2. Latin America is becoming more international. It’s time to understand that the U.S. isn’t the only country that has clout in Latin America. For far too long, U.S. officials and Latin America experts have tended to treat the region as separate, politically and strategically, from the rest of the world. But as they’ve fought battles over small countries such as Cuba and Honduras and narrow bore issues such as the U.S.-Colombia free-trade agreement, other countries like China and India have increased their economic presence and political influence in the region. It’s also clear that countries such as Brazil and Venezuela present their own challenges to U.S. influence in the region and even on the world forum. The U.S. must embed its Latin America relations in the conceptual framework and strategy that it has for the rest of the world, rather than just focus on human rights and development as it often does toward southern neighbors such as Cuba. 3. There are security and strategic risks in the region. Hugo Chavez’s systematic deconstruction of the Venezuelan state and alleged ties between FARC rebels and some of Chavez’s senior officials have created a volatile cocktail that could explode south of the U.S. border. FARC, a left-wing guerrilla group based in Colombia, has been designated as a “significant foreign narcotics trafficker” by the U.S. government. At the same time, gangs, narcotics traffickers and transnational criminal syndicates are overrunning Central America. In 2006, Mexican President Felipe Calderón launched a controversial “war on drugs” that has since resulted in the loss of over 50,000 lives and increased the levels of violence and corruption south of the Mexican border in Guatemala, El Salvador, Honduras and even once-peaceful Costa Rica. Increasingly, these already-weak states are finding themselves overwhelmed by the corruption and violence that has come with the use of their territory as a transit point for drugs heading north. Given their proximity and close historical and political connections with Washington, the U.S. will find it increasingly difficult not to be drawn in. Only this case, it won’t be with or against governments — as it was in the 1980s — but in the far more complex, sticky situation of failed states. There are many other reasons why Latin America is important to U.S. interests. It is a market for more than 20% of U.S. exports. With the notable exception of Cuba, it is nearly entirely governed by democratically elected governments — a point that gets repeated ad nauseum at every possible regional meeting. The Western Hemisphere is a major source of energy that has the highest potential to seriously reduce dependence on Middle East supply. And through immigration, Latin America has close personal and cultural ties to the United States. These have been boilerplate talking points since the early 1990s. But the demands of the globe today are different, and they warrant a renewed engagement with Latin America — a strategic pivot point for initiatives the U.S. wants to accomplish elsewhere. We need to stop thinking of Latin America as the U.S. “backyard” that is outside broader, global strategic concerns. The views in this article are solely those of Christopher Sabatini and Ryan Berger. Next entry »Will Turkey force Obama's hand on Syria? Fastidious answer back in return of this question with firm arguments and telling everything about that.